Paris has 130 museums. In addition to the permanent collection of each, most also have temporary shows that change two or three times a year. So when I’m here, I have a long list of shows I want to see. This time I have eight or nine to fit into four weeks. 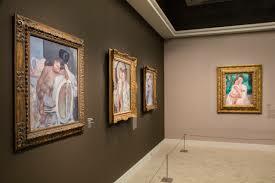 I’ve already done the Ateliers Mythiques at the Musée de Montmartre and Mucha at the Musée du Luxembourg. Today it’s the turn of the Collections Privées at the Marmottan. And with an old friend. The Marmottan-Monet Museum is a perfect place for an intimate show. Originally, it was the large home, quaintly called the “hunting lodge”, of the Duke of Valmy. (I’m presuming he hunted in the Bois de Boulogne a mere block away.) The lodge was later purchased by Monsieur Marmottan, whose son then gave it and his art collection to the Paris Academy of Beaux-Arts. For many years that was the museum’s name, and it housed a lot of Impressionist art, including Monet. Which is why decades later Claude Monet’s son Michel chose to bequeath his own collection of his father’s works to the museum... and a third M was added to the name. The permanent collections rule on the basement and upstairs levels. The ground floor houses the temporary shows, as well as rooms that have some of the original furniture, period pieces to delight those interested. Me, I’ve come for the Collections Privées, Impressionist art owned by private individuals, artworks rarely - if ever - seen outside of these individuals’ four walls. Sometimes the owner of the painting was indicated, but usually not. People don’t always want burglars to know what’s hanging in their homes. The word “Monaco” arose often, but who knows whether it’s Prince Albert, one of his sisters, or any of the über-rich people who have paid for a residence in that tax-free principality on the Mediterranean. Two names came up often. One is American, the son of a grocer who hit it rich in money management: Scott Black. (His wife Isabelle was gallantly also named as co-owner.) The other, Juan Antonio Pérez Simón, is a Spaniard who has lived most of his life in Mexico, made his money in telecommunications, and loves to loan his artworks out, which he’s done here. French magazine Paris Match says his art collection is the largest in private hands in the world. But on to the works themselves. Impressionism is all about light. How it refracts. How it reflects off things. How it can transform a color. One of the best demonstrations of this is when the artist represents dappled light, scenes with light and shadow. One canvas by Caillebotte demonstrated this: Le Jardin du Petit Gennevilliers. Obviously not the center feature of the painting, three women sit off in a corner, talking in the sun. The focus, so to speak, is on the shadows cast by the tall trees and on the walk and flowerbed, and how the fruit tree stands out against the darkness in the background. The shadow takes up a good third of the canvas, the third that’s front and center. The year being 1889, the work is still somewhat traditional, as paintings were, pre-photography. It’s a scene you now might snap with your smartphone, except broken down by... light. Toulouse-Lautrec has a painting in this show that is also photographic, but it’s a portrait rather than a landscape. He called it La Blanchisseuse (The Laundress). It’s from the same period as Monet’s garden (1886) and shares some traits. Here the focus seems to be on the woman’s white shirt, and the shadows its folds cast. A far cry from Lautrec’s famous posters. Her dreary room is made even more dreary by the contrast with the scrap of sky out her window. Lautrec has hidden the woman’s face with a lock of hair that’s fallen over her eyes as she takes a moment out of her drudgery, and there’s the merest shadow of that lock on her cheek. Again, light. Another thing that fascinated the Impressionists, something still fairly new in the world of that time, was the steam engine. The constant morphing of the rising steam was as challenging to try to capture on canvas as was light. Which is why so many artists set up their easels near Paris’s Gare St. Lazare train station and on the Pont de l’Europe bridge spanning the tracks. Pissarro captured it well in another setting: the docks, where boats wait to be loaded or unloaded. The river gave him the additional opportunity to interpret light on the water, as well as in the sky. As it was painted in 1898, Impressionism had already moved on a bit from a softer version of photographic depiction to something more personal, a step or two farther from reality. Fauvism is a school that arose from Impressionism. That name was given by yet another art critic who focused in on the unnatural colors used by some artists and likened them to fauves (wild beasts). André Derain painted a portrait of fellow artist Maurice de Vlaminck and the colors he chose fall within this definition, especially as one eye is blue and the other is black. As far as impressions go, this portrait gives no more than an impression of what Vlaminck actually looked like. Based on photos of him, it’s about as unreliable a police sketch as it could possibly be. A mere outline of a face, with a line for a nose and only a patch of hair. And yet, as a piece of art, it’s works. There were also a few pieces of sculpture in the show. One was a chillingly striking head of St. John the Baptist by Rodin. I saw one such head once in a church in Madaba, Jordan. What’s striking here, in addition to Rodin’s mastery of the chisel, is the coldness of the white marble. You’re sure he’s well and truly dead. In contrast to that, there’s a child’s head by Rodin’s student - and paramour - Camille Claudel. It’s displayed with a mirror behind it so you can stare into the child’s eyes yet see the loosely braided hair flowing down her back. Head slightly tilted up, she seems to be waiting for something, expecting something. The artist leaves it to us to imagine what. There were many more artworks in this show. But these were the ones that called out to me the most. And most of them will never be seen publicly again. Unless it’s at Sotheby’s or Christie's. When I was in Prague last fall, I went to the Mucha Museum. So going to this Mucha exhibit at the Musée du Luxembourg was kind of like visiting an old friend. For starters, as of the first room, there was the same photo, taken by Mucha of his good buddy Gauguin, newly arrived back from Polynesia, playing Mucha’s piano dressed in only a mercifully long shirt, his bare feet and legs working the pedals. Of course, Toulouse-Lautrec had already made posters a new art form, up in Montmartre with La Goulue and Jane Avril. But Mucha took it even further - and lived longer. His success was helped along by works for the renowned jeweler Fouquet, and later by an exclusive contract with Parisian printer Champenois. With that, he could move from his cold Grande Chaumière artist studio in Montparnasse to a quite posh apartment in the toney Val de Grâce neighborhood, a setting suitable to invite all his rich new friends. After years of success, Mucha moved back to the now-independent Czechoslovakia, after several trips to the States to find a patron for his masterpiece, The Slav Epic. (Wealthy Chicago businessman Charles Richard Crane filled the bill.) For many years Mucha worked fervently on that project to the glory of his Slavic ancestors, culminating in twenty intricate canvases recounting scenes from Czech history as well as that of other Slav nations. But in the end, Czechoslovakia savored only twenty years of independence, and when the Nazis marched into Prague in 1939, Mucha was one of the first people rounded up by the Gestapo. Too famous... and also a Freemason. He caught pneumonia in prison, whereupon the Nazis freed him, not wanting him to die in their custody. But die he did anyway only days later, shortly after his 79th birthday. Mucha is more than just one of the artists in the dccorative arts movement of the turn of the century. He came along at the birth of Art Nouveau, with its sinuous forms, floral motifs, ornamental lines and lovely young ladies, all rendered in a subtle palette of pastel colors. Mucha is the embodiment of the genre. Alphonse Mucha IS Art Nouveau. At their death, the house was bequeathed to the Institut de France with the proviso that it become a museum. It still has the original furniture and decoration, including a fresco by Tiepolo on the grand staircase and another on the ceiling of the adjoining room. The couple’s art collection, especially of Italian masters, is considerable and a tour of the house is well worth your time while you’re there. But given Nélie’s artistic bent, it’s only fitting that part of the mansion should be reserved for temporary art exhibits. The present one spotlights the talent of one of the first women artists of Impressionism, Mary Cassatt. And an American to boot. A short film - unfortunately only in French - at the entrance to the show discusses the birth of Impressionism and Cassatt’s place in it. Much of it underlines her close friendship with Edgar Degas. 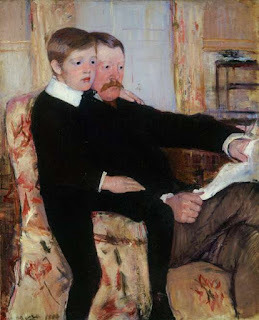 And there’s something fitting in that, because while the family of Cassatt’s father were French Huguenots who immigrated to America in 1662, Degas’s mother was from New Orleans, so they had that Franco-American link in common. Yet in spite of her American-ness, Cassatt chose to live most of her life in France - almost sixty years. Over that span of time, and thanks to her friendship with Degas, she became part of the Impressionism movement. Her art slowly transformed from the classicism that won her a place in the rigidly traditionalist Paris Salon in 1868. But as it changed, the doors of the highly-formal Salon closed to her, as they did to others who then chose to react by creating their own movement: Impressionism. The first room of the exhibit includes a few works by Degas of his good friend Mary: one at the Louvre as she admires a painting, another of her buying a hat, and one of her just sitting, a portrait she hated. There’s also that canvas that won her a place in the 1868 Paris Salon - A Mandoline Player - which enables you to see the artistic territory she covered in her evolution as an artist. In one of the other rooms is a 1913 quote by Achille Ségard, author and art critic: “Instead of choosing the easy road, she felt the need to concentrate on the realities of volume, the movement of lines and of sentiments.” Although she did several canvases of her brother Alexander, one of which is on display here in the second room, her favorite subjects were women with their children. But not maudlin images. No. One of the first feminists, she chose to show the noble side of women. Like the other famous woman artist of the day, Berthe Morisot, she is known for her portraits. And yet this exhibit also includes many of her aquatints (La Toilette) and dry points (Dans l’omnibus), which she printed out herself on a press she bought and learned to operate. Room 4 concentrates on these works. Many of them fall within the period where she, like other Impressionists such as Monet, became fascinated by Japanese prints, and a Japan-effect is clearly visible. The most famous, perhaps, of all her works is the one chosen for the exhibit’s billboards and publicity: Little Girl in a Blue Armchair. It shows a young girl slouched in a blue chair, one arm behind her head, her gaze lost in little girl dreams, her dog on the chair opposite her. You wonder what she’s dreaming of. An interesting point about this canvas is that Degas lent a hand; the back wall that Cassatt had painted straight has been “corrected” by Degas, transformed into a corner with angles in order to better focus the eye on the girl. It’s the only one of her works where Degas took up the brush himself instead of just making suggestions. One good point about this little girl, for me, is that she isn’t overly rosy of complexion. It’s the one detail of Cassatt’s paintings that I dislike. I dislike it in Renoir also. Both tended to paint overly-rosy cheeks and full faces, unlike Monet or Degas or the other Impressionists. 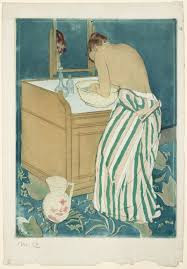 I also admired the print called La Toilette. It shows a woman, modestly turned away from the viewer, her blouse off, washing up in a basin of water on her commode. The curve of her back is admirable, the bare corner of her face teasingly visible in the mirror, and the blues are amazingly vibrant. The oil of mother and daughter in a boat watching the ducks (Summer) demonstrates a typically Impressionist rendition of water. The splashes of blue, underlined with yellows and oranges and greens, perfectly translate the movement of the water and the reflections broken up by that movement. In spite of this fascination for mothers and their children, Mary Cassatt never married and never had children of her own. Her canvases were her children. And she managed to actually live from her art, unlike others such as Van Gogh. After a long life as artist, she, like Monet, developed cataracts and decided to put down her brushes. A sad end for an artist. This collection of some 50 pieces is the first collective exhibit in France of Mary Cassatt’s works since her death in 1926. In addition to works that have stayed in France, there are canvases from all over: from her native Pittsburgh, from Philadelphia where she attended art school, and from New York, Boston, Chicago, Cincinnati, Newark and Washington, D.C., as well as Lisbon, Zurich and Bilbao. That’s the great advantage of such a retrospective show: bringing together works you would never see side by side otherwise. And the exhibit gives a good perspective of how her art evolved from the pure classic style of her early years to the whittling down to a more bare minimum of lines and colors. If you like portraits in particular, you will thoroughly enjoy this exhibit. Note: Although the explanatory boards are in French only, audio-guides are available in many languages.